It's been a long time since I've been active on here, I've had too much reality cutting into my 8-Bits of free daily time! I'm working my way back into both Spectrum and Amiga gaming, two player Exploding Fist has proven to be a lot of fun lately! Anyway, I'm rather excited about this upcoming piece of kit. 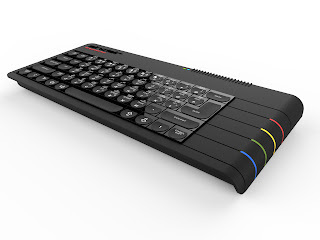 The ZX Spectrum Next looks like it's going to be the real deal. A modern day ZX Spectrum that will capture the essence of the original 1982 machine for the current era. When you look at the people involved (Rick Dickinson, Victor Trucco, Jim Bagley, Henrique Olifiers and Fabio Belavenuto) you cannot help but become excited. You can read more about the latest developments at ZX Spectrum Next. I already know that I have to have one.